Williams and William West Gold Option - White Metal Resources Corp. The Williams and William West Gold Properties (collectively the “Property”) are located in the southern region of the Botwood Basin of northeastern (Central) Newfoundland. White Metal Resources (WHM) optioned the Williams on October 25, 2018 and staked the Williams West in November, 2018. 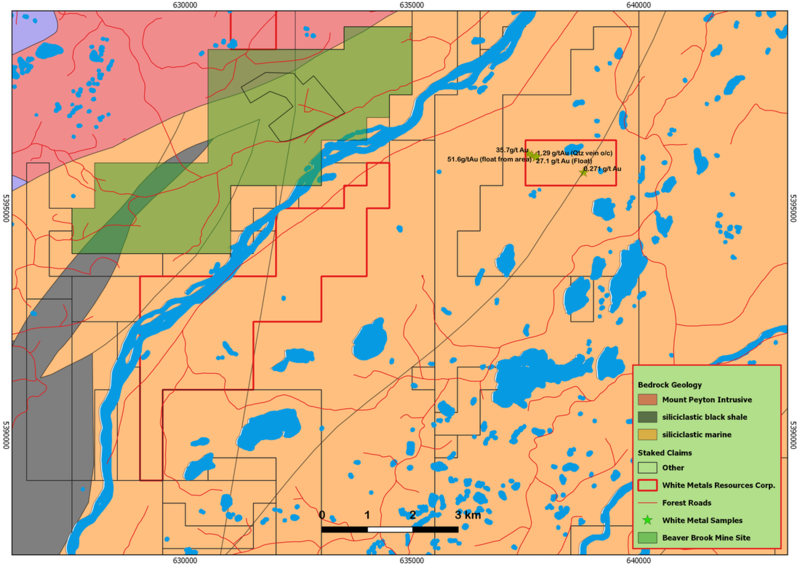 The Property, representing a new polymetallic (Cu-Zn-Pb-Au-Ag) discovery with high-grade gold, is in an area that has seen very little exploration. 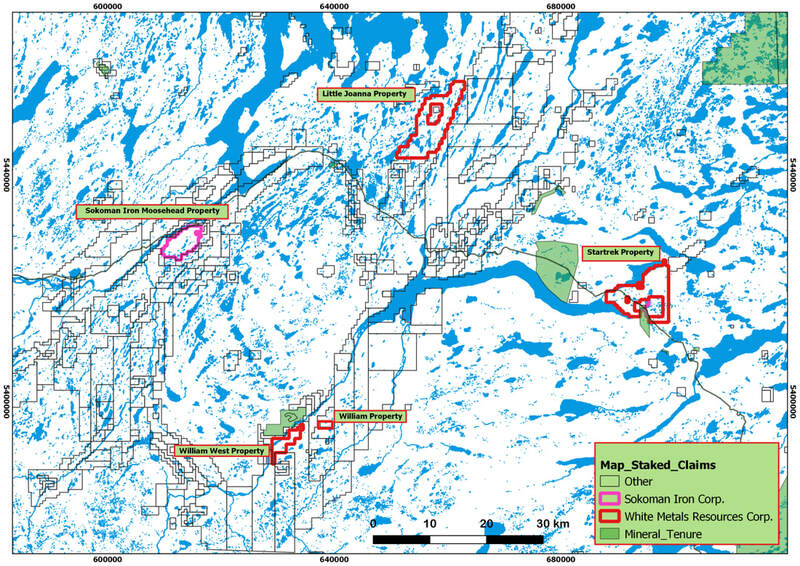 Williams is about 40km southeast of the Moosehead Gold Project and 12km southwest of the Clarks Brook Gold property, both held by Sokoman Iron Corp. (TSXV:SIC). In mid-2018, Sokoman announced their gold-bearing discovery hole (news release dated July 24, 2018) from the Moosehead Gold Project, reporting a drill core assay result of 44.96 g/t Au over 11.90 metres (from 109.00 to 120.90 metres). The combined Property consists of 58 claim units covering 1,450ha of which 8 claims (Williams) were optioned from the Vendor and 50 claims (Williams West) added by WHM. The two properties are not contiguous, separated by a distance of approximately 3km. The Property is located about 50km southwest of Gander (pop. 11,688) and approximately 40km southwest of Glenwood (pop. 778), northeastern Newfoundland (NTS 002D/11). Forestry access roads, originating from the Trans-Canada Highway, provide access to the Property. The Main showing at the Williams Gold Property is located at approximately UTM 638777mE, 5396007mN (NAD27/Z21N). The Property is situated within the Botwood Basin, with the eastern half of the Property underlain by Cambrian to Ordovician siliciclastic sediments (Eastern Dunnage Zone; Outflow Formation) and the western half by Silurian siliciclastic sediments (Botwood Group). 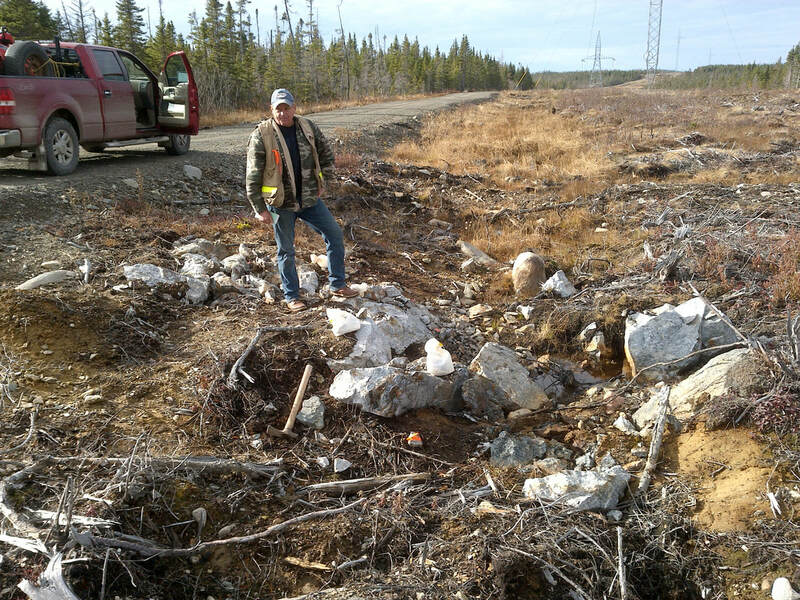 This is a similar geological environment to the Clarks Brook gold property to the northeast where Sokoman Iron reported a drill core intercept of 3.74 g/t Au over 3.10 metres, including 14.73 g/t Au over 0.60 metres (Sokoman Iron Corp. news release, dated April 5, 2018). Gold is generally associated with pyritic quartz veins and hosted by siltstones, sandstones, and conglomerates. 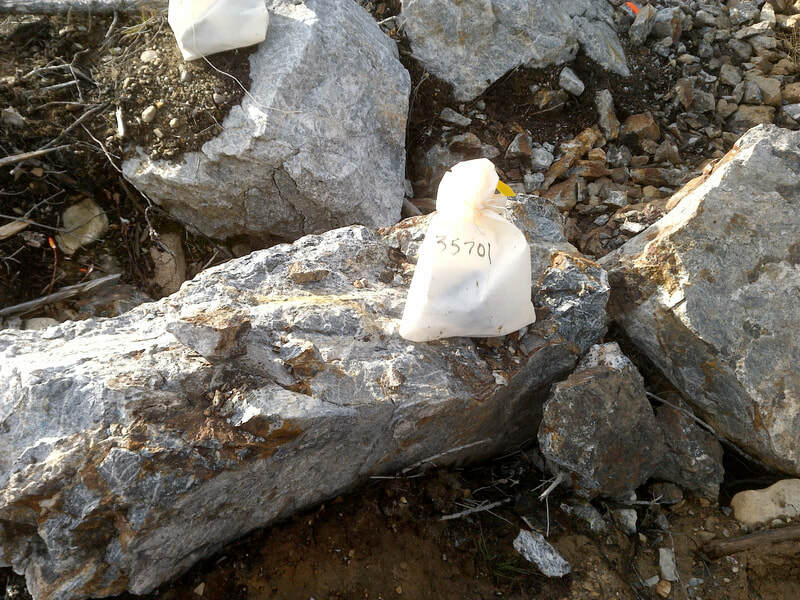 The Williams Property is a new polymetallic discovery with an extensive area of anomalous quartz-veined, brecciated, granite/sediment float, and subcrop with grab samples up to 52 g/t Au (1.52 oz/t Au). Mineralized and quartz-veined granites, black shales, siltstones and volcanics are found over a distance of 3 km. 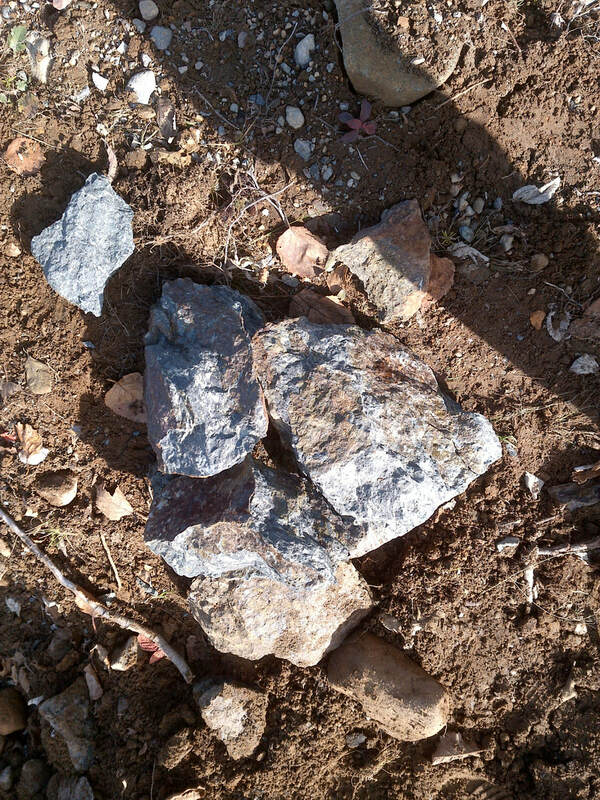 Subcropping mineralized rocks are found over an area 200 to 300 metres in length and widths estimated at two to three metres. Two samples from subcrop collected by the Vendor assayed 5.8 g/t Au and 7.9 g/t Au. These samples were at least 200 metres apart and occur in a unit of intensely silicified, brecciated quartz-veined black shales. These grab samples contain up to 2% chalcopyrite (Cu), sphalerite (Zn), galena (Pb), and antimony (Sb) with some assays returning >1000 ppm As. Besides the work of the current Vendor, in the late 1980s Noranda Exploration conducted an extensive exploration program in the region. This program, consisting of prospecting, geological mapping, geophysical and geochemical surveys, trenching and diamond drilling (Tallman, 1989), led to the discovery of a number of significant showings and prospects in the region, including the Aztec and Goose showings several kilometres along strike to the southwest. The most significant discovery was that of the Beaver Brook Antimony deposit, located 5km to the west, which was a direct result of prospecting and stream silt sampling programs (Tallman, 1991). 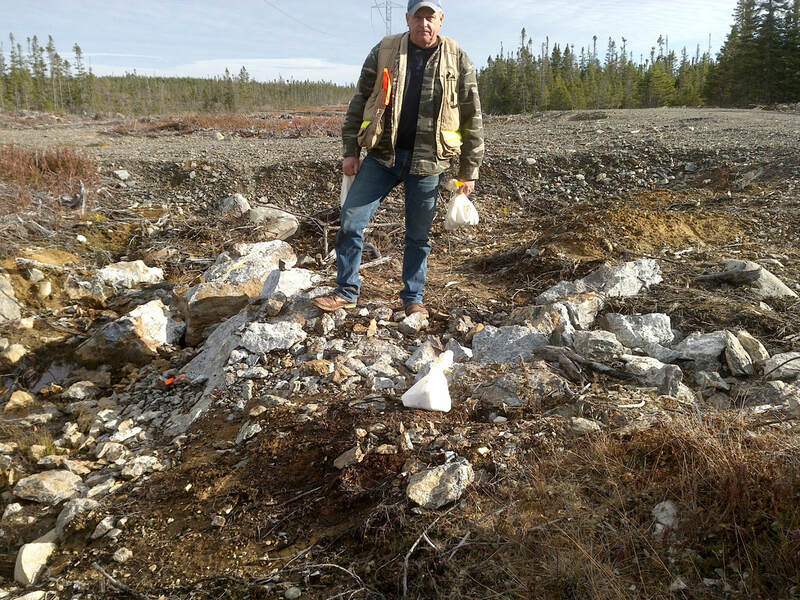 Mineralization on the Williams Gold Property represents a new polymetallic discovery in the area. Positive exploration results by Noranda Exploration (1980s) suggest the region is highly prospective for polymetallic mineralization and antimony. With little exploration on the Williams and Williams West properties, there is a strong possibility for further discoveries. Quote may be delayed. Provided as a convenience with no representation as to the accuracy of data.